Iraqi government forces fighting so-called Islamic State (IS) in Mosul have reached the banks of the Tigris river in the city for the first time. A spokesman for the counter-terrorism forces said they had reached the eastern side of the river at one of the bridges damaged by IS. 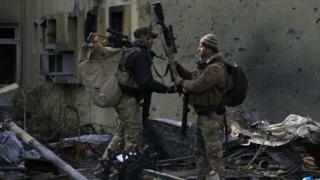 Government forces launched an offensive to drive IS from its last major stronghold in Iraq last October. They have been pushing into the city district by district from the east. The military said counter-terrorism forces (CTS) had also fought IS near a historic site close to the bridge. Lt Gen Abdelwahab al-Saadi was quoted by Reuters as saying troops advanced in two directions towards the Baladiyat and Sukkar districts. "During the advance, Daesh (IS) tried to confront us from the historic hill," he said. It is thought this could refer to a hill near the ruins of the ancient Assyrian city of Nineveh. Gen Saadi said warplanes from the US-led coalition killed dozens of IS militants who were using the hill as a position to fire from. The advance on the Tigris comes two days after government forces captured the key district of al-Muthana in an overnight battle. It was part of the second phase of the push to retake Mosul, which began at the end of last month. According to the government, about two-thirds of east Mosul has been brought under government control since October. The US-led coalition against IS says Iraqi forces are regaining the initiative after fierce IS resistance in December markedly slowed the advance. IS took Mosul more than two years ago and went on to seize control of much of northern and western Iraq. The operation to retake the city has involved Iraqi security forces, Kurdish Peshmerga fighters, Sunni Arab tribesmen and Shia militiamen, assisted by US-led coalition warplanes and military advisers. More than 100,000 people have fled their homes in and around Mosul as the offensive continues.